In cooperation with id Software and Bethesda, ESL is excited to be a part of the resurgence of Quake esports. As one of the original esports titles, the newly released Quake Champions will revitalize competition for the classic gothic-style first person shooter with the $1,000,000 Quake World Champions. Duel (1v1) and Sacrifice (4v4) competitions will kick off this June and culminate in a live Finals at QuakeCon from August 24-27, 2017 in Dallas, Texas. 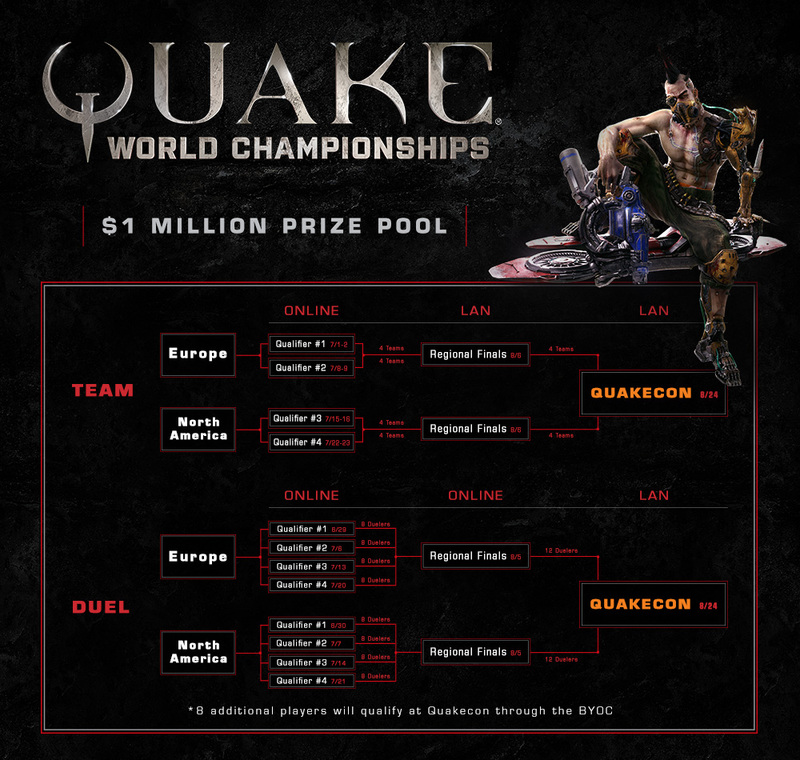 Online qualifiers for the Quake World Championships begin in just a few weeks for competitors worldwide. After battling through qualifiers this June and Regional Finals in August, eight Sacrifice teams and 24 Duel players will travel to the Finals event at QuakeCon 2017. Eight additional Duel players will be selected from the QuakeCon BYOC Qualifier. Players in Russia and Asia will play in EU qualifiers, players in the Americas and Australia will play in NA qualifiers. Competitors should register by visiting https://play.eslgaming.com/quake/. Complete rules and eligibility requirements can be found online. Wednesday, June 14 through Thursday, June 15, the E3 ESPORTS ZONE will host competitions and dev talks for Quake Champions. Tune in as North American and European pro’s battle in the first esports production for the new game! Developers will also take to the stage to discuss game features in detail to introduce Quake Champions officially into the world of esports. Competitors from Team Liquid, including 2016 QuakeCon Duel Champion, Rapha, will appear Wednesday, June 14 beginning at 10:30AM Pacific, alongside Tim Willits and John “ZeRo4” Hill from id Software. Rapha will be joined by Team Liquid teammates ID_, DaHang, and Azk. On Thursday, June 15, top competitors from Europe, including Noctis, Fazz, Stermy, and toxjq will take over the stream with their own play beginning at 10:30AM Pacific. You can tune into the #E3esports activies at live.e3expo.com. Keep an eye on the ESL Quake Twitter and Facebook for highlights from the E3 showfloor and updates on the future of Quake esports.